Please see attached image for an example how it looks in terminator and how it is supposed to look. Install [FiraCode] and use it as terminators font. Type `=>` into the terminal. It will show as a blank followed by the arrows tip until the window looses focus, then the sequence will be displayed as a doublesided arrow. From then on it will remain in that state and after deleting parts of the sequence the left arrow tip will stay forever. Perhaps there are similar problems with other “programmer fonts”. Which version are you raising this against. Main trunk GTK2? Unlikely to be fixed. GTK3 port? If so, then it is worth investigating, although I'm 99% certain that this would then be against the libvte project, not Terminator. 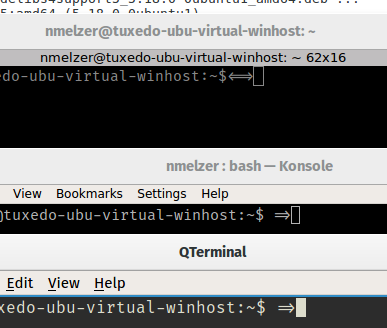 Have you tested this against an up-to-date gnome-terminal? If it works there it will probably work in the GTK3 version of Terminator. Also in the descriptiontext of the libvte package it claims to be an “Terminal emulator widget for GTK+ 2.x”. Everything is installed from Canonical repositories for Xenial (16.04 LTS). So if this is related to GTK2, perhaps installed dependencies are wrong? I'm not able to install or build more recent versions on that VM, since it has to mimic a given environment as close as possible. I will see if I can reproduce the problem in another VM or my personal laptop in the next couple of days. I'm going to mark this as invalid/not-responsible, as it is not the terminator program that cannot handle the ligatures, but the underlying (and common in many other terminal apps) libvte widget. Until the widget supports it there is nothing terminator can do.